YLAB arquitectos renovated a 100 square meter apartment with a big terrace in an old building in the hearth of a traditional neighborhood in Barcelona. The house has a very deep and narrow floor plan and only two facades at the ends, one to the street and the other one to the terrace in the inner courtyard. 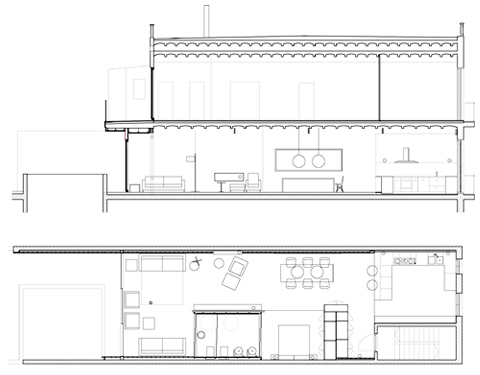 The proposal is an integral architectural intervention of the space with two main goals: to maximize the lighting and ventilation from the facades eliminating unnecessary partitions, and to obtain a new distribution that contains all the uses required by its young owner: a bedroom suite, a guest bathroom and bedroom, a working studio, a kitchen and a dining room for parties and meetings. In order to maximize the lighting it is necessary to achieve a structural intervention that completely eliminates the internal partitions and a structural wall located directly behind the back façade, which is key to the optimal use of light. Moreover, due to the difficult geometry of the housing, all the different functions can only be accommodated through a flexible and unconventional distribution that allows joining and separating spaces and even change their function, depending on the occasion. The new distribution consists of a large diaphanous and spacious common area, which runs continuously from façade to façade, and a private semi-closed box formed by the bedroom suite and guest bathroom. The common area is formed by the entrance hall, dining room, library, studio and living room in the rear facade, and the kitchen in the front facade. All these areas are aligned along a longitudinal wall made of hand made solid brick. The bedroom is located between a high cupboard, with the double function of entrance hall wardrobe and bedroom closet, and a large wooden core containing the two bathrooms, which becomes a piece of furniture with shelves in the studio area. 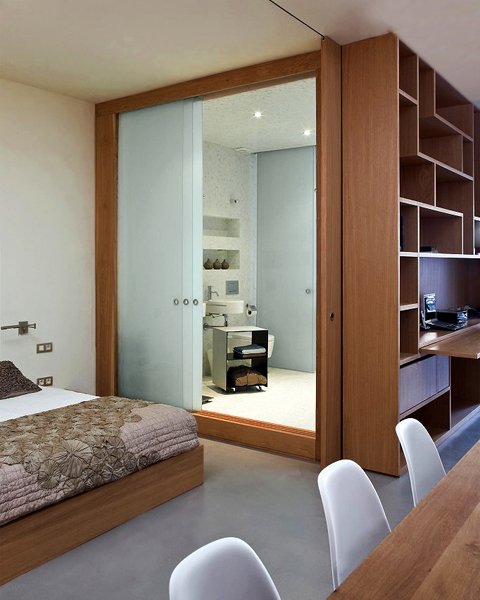 This furniture hides two large sliding wooden doors that allow the independency of two different spaces: the bedroom, which is separated from the common area, and a part of the living room containing a sofa-bed, that allows a punctual use as a guest room. The wooden core is a deep framework framing and raising the bathrooms. The cross partitions are resolved with sliding translucent glass doors to enable lighting, ventilation and visual connection between spaces. 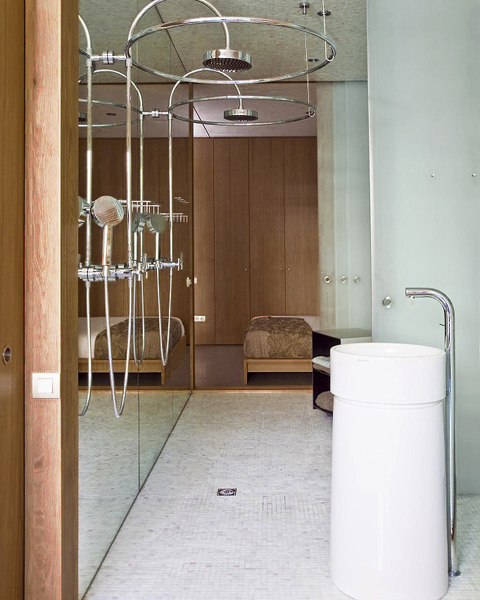 In the inside all inner surfaces, including ceiling and floor, are covered with light colour Bisazza mosaic and mirror. 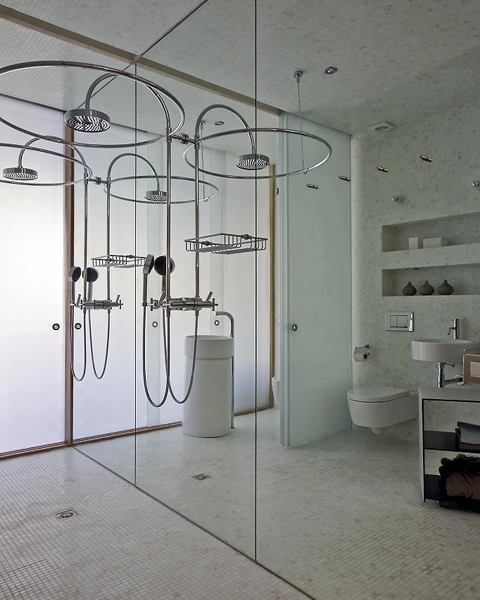 The sanitaries and fixtures are suspended or free standing to contribute to the feeling of transparency. The result is a game of gloss and reflections that multiply the light and convert the bathroom into a bright and sophisticated space, in contrast to the warm and sober rest of the house.